Quick review of Baltimore Drop. Baltimore Drop is a cross between a pinball machine, Pachinko and the back of an arcade 2p machine (or coin pusher as I think they’re meant to be called), and it’s an absolute gem of a fixed odds game. Baltimore Drop is wonderfully simple. It’s the perfect example of how a simple idea, executed effectively will result in an addictive and incredibly fun game to play. Even if you couldn’t care at all for pinball machines or those infamous arcade 2p machines, I’m sure that you’ll still love to play Baltimore Drop anyway. Baltimore Drop fun rating - 84%. Baltimore Drop works so well. The fact that you can easily keep track of where your bets are and the progression of the pinball down the machine means that the tension and excitement is always high. Unlike most games, in Baltimore Drop you can always see how close you are to getting lucky or winning money. It’s a simple game where nothing is hidden, which leaves you to focus on anticipation and excitement from start to finish. The only thing holding Baltimore Drop back from a higher fun rating is the lack of a "turbo" mode and the relatively low maximum wins. However, I’m not going to dwell on those facts because I just love the design of the game so much. How to play Baltimore Drop. The basics of Baltimore Drop. Place your bets on the pins and pots you think the pinball will hit or land in. Choose how many balls you want to have released in one game. Release the balls and feel the excitement. Baltimore Drop in more detail. A pinball is released from the top of what resembles the back of an old-fashioned arcade 2p machine. 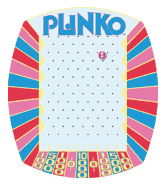 For those of you familiar with The Price Is Right, it’s a lot like Plinko too. As the pinball drops through the machine it will hit pins on its way down before ending up in one of 6 different pots. 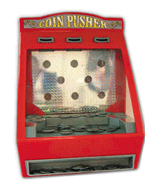 The pot it lands is dependant on the route the pinball takes through the machine on its descent. When the pinball hits a pin, it has a 50/50 chance of either traveling to the left or traveling to the right of it. How to win money in Baltimore Drop. You can place bets on which pins you think the pinball will hit. You can place bets on which pots you think the pinball will land in. If the ball drops out of bounds, any bets on pins will not count. Some pins have more chance of being struck by the ball than others, just as there’s more chance that the ball will fall in to some pots than others. The less likely the pin or pot is to have a ball come in to contact with it, the bigger the payout will be if you bet on it. Fact: As a rule of thumb, the further the pin or pot is from the centre line, the bigger the payout is. It’s most likely that the pinball will remain close to the centre of the table. You can bet on as many pins or pots as you like in the gameand you can have multiple winning wagers. 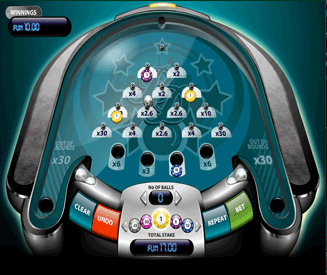 In addition to betting on pins and pots, you get to select how many balls will be dropped through the table in one game. 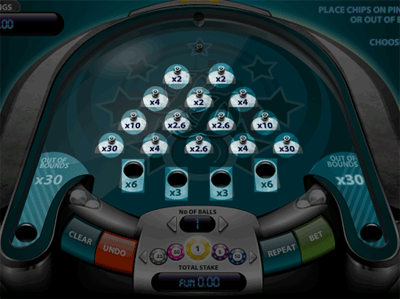 However, your total wager for the game will be multiplied by the number balls you have in play. Basically, if you increase the number of balls, it’s just like playing a bunch of standard games consecutively. Note: You can play Baltimore drop with as little as 1 ball or as many as 100, and any number in between.